Borrani Red on Clear Stickers. Set of 4. 2.5". Carlo Borrani S.P.A. Milano Clear Stickers. Set of 4. 28mm. CMR Costruzioni Meccaniche Rho Milano Stickers. Set of 5. 1". Ruote Borrani Milano Black on Cream Stickers. Set of 4. 16mm, 25mm or 50mm. Ruote Borrani Milano Black on Silver Stickers. Set of 4. 25mm. Ruote Borrani Milano Blue on Gold Stickers. Set of 4. 25mm. Ruote Borrani Milano Blue on Silver Stickers. Set of 4. 25mm, 45mm, or 50mm. Ruote Borrani Milano Clear Stickers. Set of 4. 25mm. Ruote Borrani Milano White Stickers. Set of 4. 25mm. 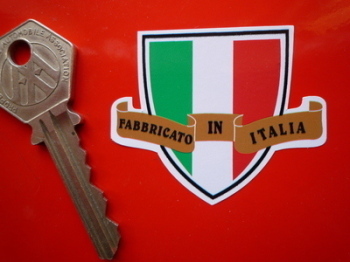 Scuderia Italia Cut Vinyl Car Stickers. 7" Pair.